Never thought you'd see another food post, right? Well, it's fall, and it's the time of year when I feel like cooking and sharing great recipes. I don't know why, but something about fall motivates me. I love the crisp days and cool nights, the leaves turning red and orange and yellow, the pumpkins. All of it. So today, because it's fall (or autumn, depending on where you live), I decided to dust off the Fabulous Friday Food series here on the old blog and tell you about the very best grilled cheese sandwich I've ever had. Settle in. This may take a while. A few weeks ago my friend Kim and I headed into the city to meet our daughters for lunch. Kim's daughter is a couple of months away from having her first baby--woot!--and it was fun to catch up with her. Kate, of course, lives in the city and has repeatedly told me about this spot called The Allis where she sometimes goes to work or to meet friends. 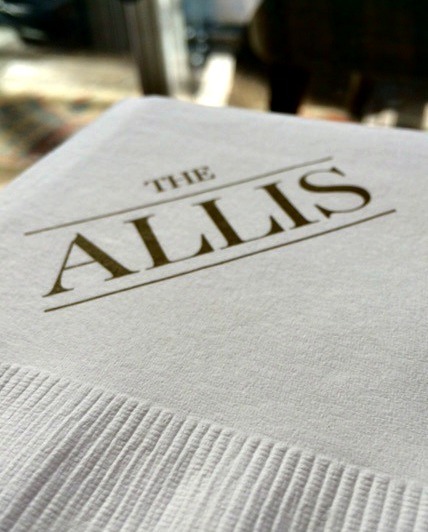 I've been wanting to try The Allis, which is located in the Soho House Chicago, so that's where we decided to meet for lunch. Besides, I LOVED the atmosphere, and as long as they didn't mind us old ladies sitting in their lobby munching on lunch (we did, after all, have our very cool daughters with us), I didn't mind the hipsters walking back and forth carrying their portfolios and working on their laptops. 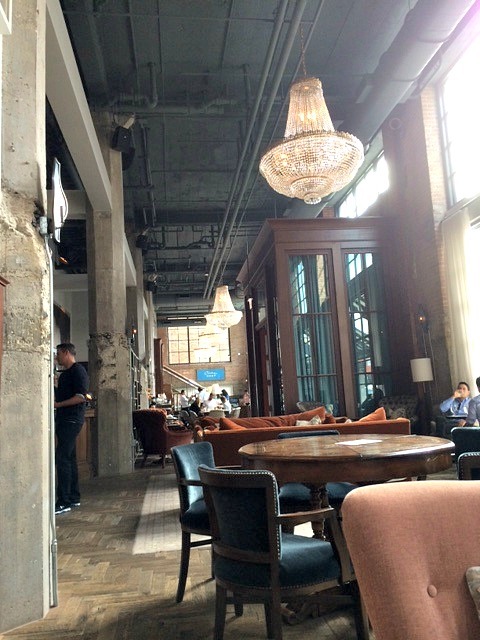 We sat on an overstuffed sofa and soft, retro armchairs around an antique glass coffee table. Chic. We ordered lunch, and very soon I forgot about feeling out of place because suddenly I was in heaven. 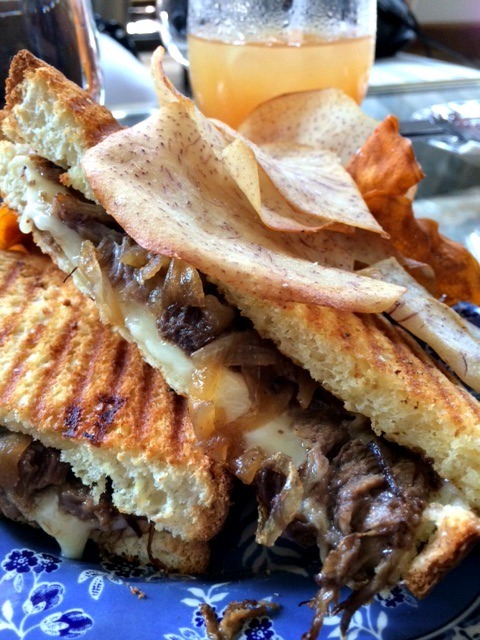 I had ordered the short rib grilled cheese sandwich (because I like to watch my calories, you know), and I was transported into another realm. 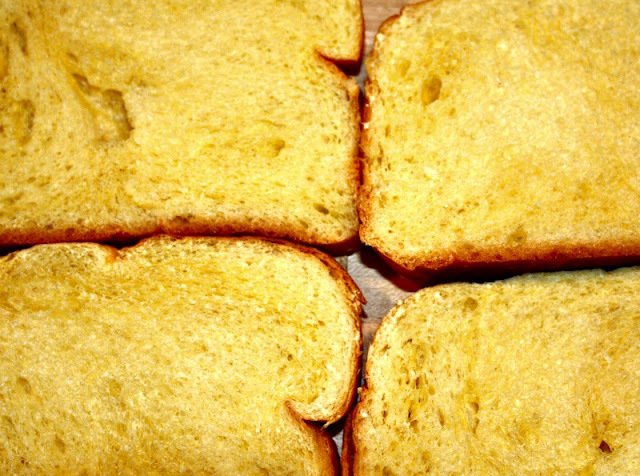 The realm of the divine grilled cheese. This was, without a doubt, the most innovative and delicious grilled cheese sandwich I had ever tasted. And I've tasted a few. When I got home I could not stop thinking about that silly sandwich. 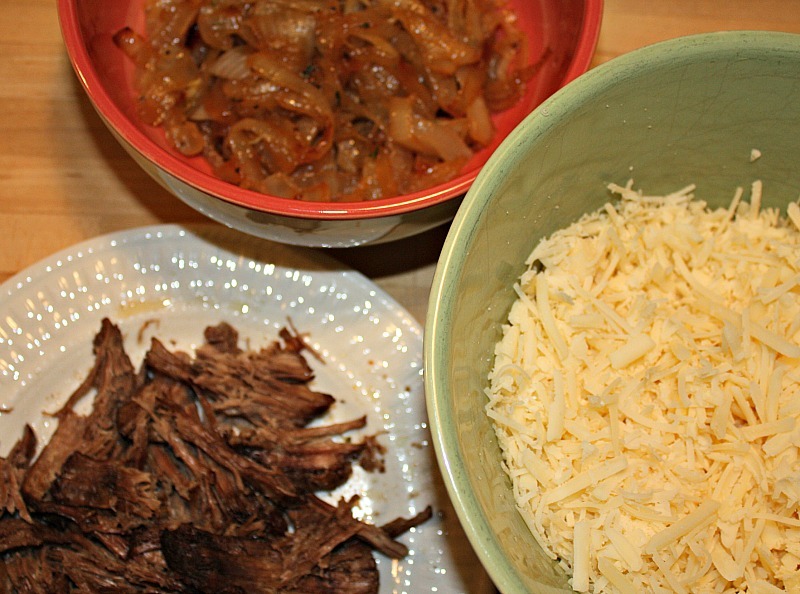 It was a mix of amazing cheeses, caramelized onions, and short rib meat. 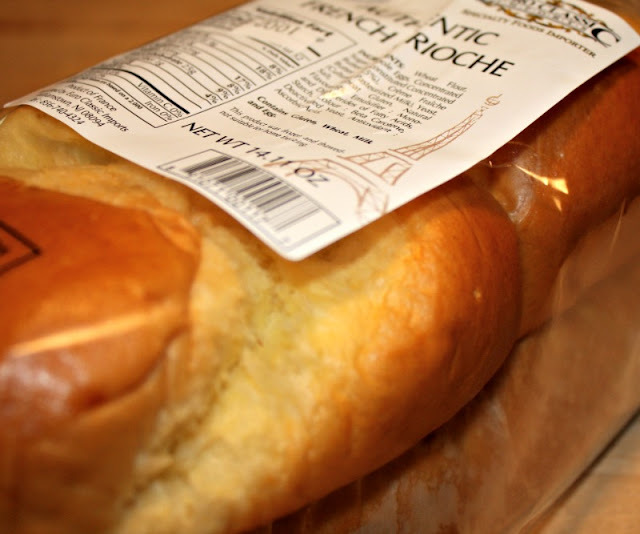 All on brioche bread. About a week later I made a pot roast (I used Ree's recipe, I think) and had a little left over in the fridge. 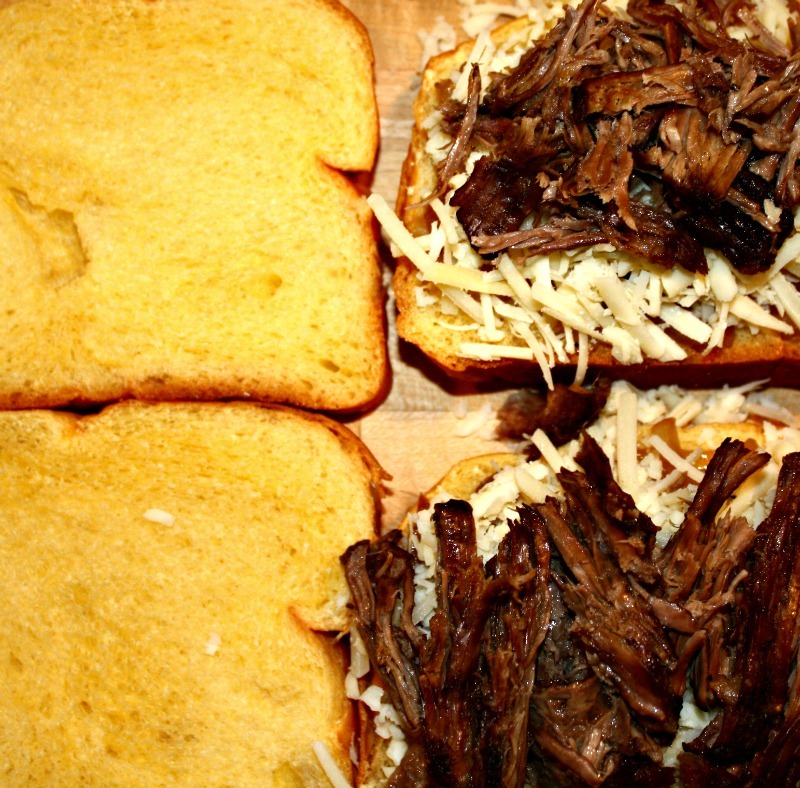 The next day my mind started to wander back to the amazing grilled cheese from The Allis and it hit me--leftover pot roast is similar to short rib meat, so I could recreate that sandwich right in my own kitchen. Of course, we'd have to eat it at home rather than at the hipster joint known as the Soho House, but we put on our thick glasses and knit caps and did our best to recreate the experience. Anyway, here's how I did it. I took a beautiful loaf of brioche bread and cut it into thick slices. I shredded some of the pot roast with two forks and warmed it just briefly in the microwave to take the edge off the coldness from the fridge. 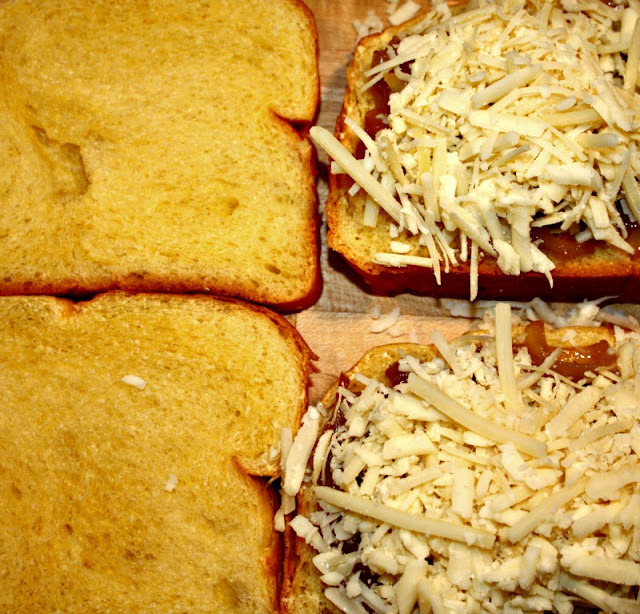 I shredded some cheese--white cheddar and gruyere, I think. Fontina might also be a nice addition. 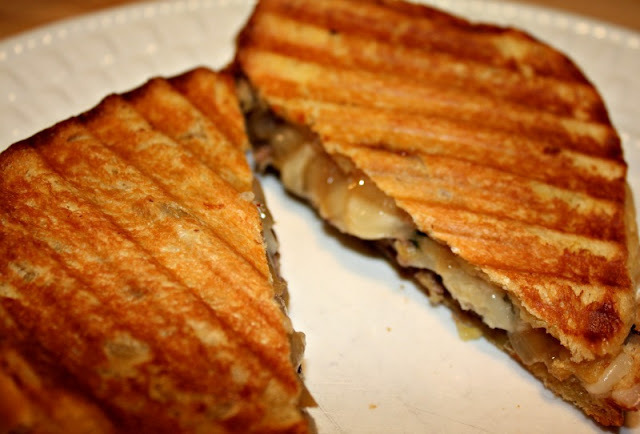 And then I pressed the whole thing in a panini press until it was golden brown and melty. You know what? A fancy grilled cheese, even though it's easy to make, feels like such an indulgence on a chilly evening. 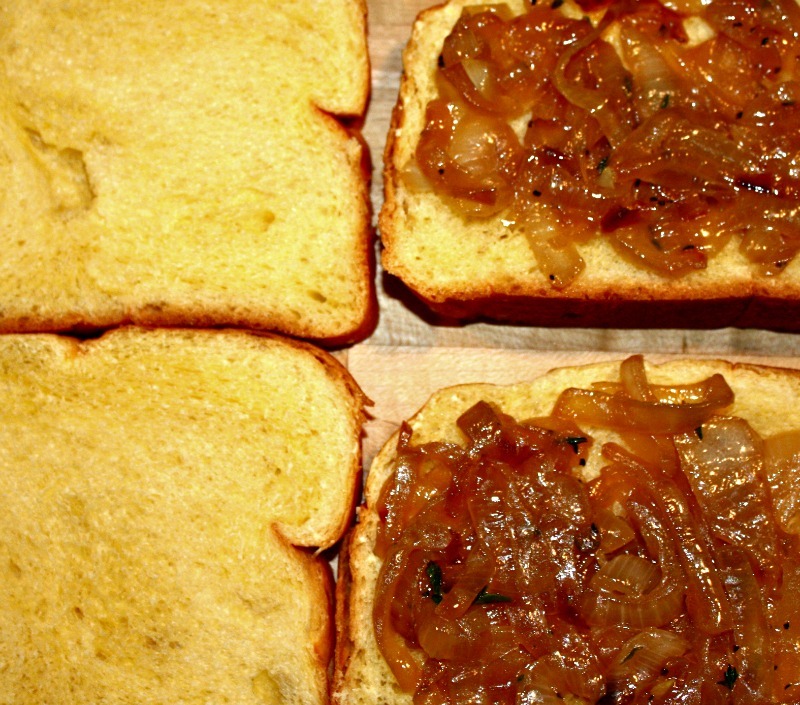 Serve it with some soup and you've got a great meal. Go ahead, give it a try! You won't regret it at all. So tell me, what are you cooking this weekend? Leave me a comment and let's talk food! I love sharing stories and I love that you read them. I'd so appreciate it if you'd sign up for email updates (you can do that on the right hand side over there), follow me on Facebook or Instagram, or leave me a comment below. I'm so glad you're here! You also know that I have a Recipes page, right? Just click on "Recipes" above and you'll find lots of inspiration for the week ahead. Well, about a week late to this party! 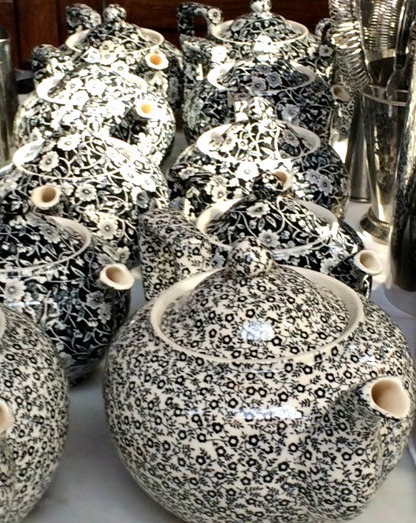 Looks really great - and I'll be trying that out! As a side note, my family LOVES your carbonara recipe! Well, we are soup lovers. And I made a great Cuban Black Bean soup for them this past weekend that they loved. Their other 'to-die-for' in the winter is a Baked Potato Soup With Bacon, Scallions & Cheddar. Both are from The Kitchn site. I made no changes to the Black Bean soup, but in the Potato Soup, I made the garlic mandatory, & way more than 1 clove. The Potato soup is the one I bring to 'Soup Sunday' at our church - the boys (& men) line up at my crockpot until I scrape bottom!